Mary Holmes is a second grade language comprehensive teacher in the Key School. She has been working at Carolina Day School since January 2013 and has a daughter in the Middle School. 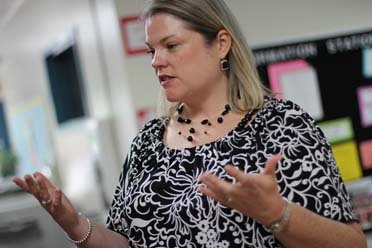 Mary's association with the Key School began July 2008 when she participated in the Key Learning Center’s Basic Multisensory Orton-Gillingham training. “This training forever changed my professional teaching life. I learned how to meet the needs of struggling readers in a prescriptive, sequential, diagnostic way. Being able to help students with dyslexia in a professional, collegial, nurturing, challenging environment is a blessing. I had not experienced the incredible level of caring collegiality at any other school before coming to Carolina Day School. The faculty and staff here support and celebrate each other while challenging each other to be better educators. I am constantly encouraged to grow and expand my knowledge and teaching skills.